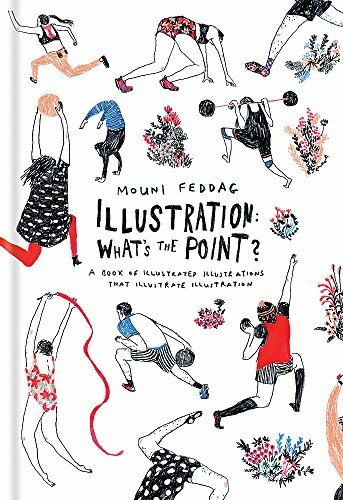 I bought this book because I like the rather whimsical drawings of Mouni Feddag while I was browsing the book. The title is quite catchy. Illustration: What's the Point? : A Book of Illustrated Illustrations that Illustrate Illustration. Highlight of this book are the drawings. I like the simple comical looking characters. The use of mixed media, pen and pencil, produces a rather raw look that I find really cool. I love the look and feel of hand drawn art. The use of colours is very limited and works great here. The downside is the text. The book is suppose to talk about illustration, and indeed it does, but it talks about illustration in sort of an abstract manner. To me it's just random musings from an imaginative overthinking illustrator. Occasionally, there will be comic strips of the author chit-chatting with her friend. On other pages, it would be quotes or statements that confuses me as to why they are included in the book. In a way, it really captures the essence of the book's title, Illustration: What's the Point?. My recommendation. Get the book for the art and don't think too much about the text.